For optimal enjoyment in the month of December I like to have at least a dozen gifts on hand by the first week. These are used for hostess gifts, neighbors and other special people in our lives. I typically purchase multiples of my favorite things. I prefer Hygge inspired gifts (comfort, warmth, wellness, contentment). The gift boxes I made last year included my Grandparent’s Kolacky recipe, hot chocolate spoons, candied pecans, magnolia bowls, peanut butter truffles (just peanut butter mixed with powdered sugar and dipped in chocolate), and my favorite candle. This is my favorite way to recycle all the shipping boxes we receive this month. I try to avoid using plastic and instead make the storage part of the gift. You can find unique and inexpensive bowls and glassware at Homegoods or TJMax. I purchase these canning jars every year for the smaller edibles and love the Magnolia line I mentioned above. Adding some fresh greens from your garland or garden is a lovely final touch. One year I purchased kitchen towels and wrapped pears inside attached with a mini photograph. Gift giving is all in the heart, and the presentation. I like to include my favorite things because I think it helps with the idea of it coming from a place of love. I want our home to tell the story of who we are. Our pool bath (called a pool bath because it has a door to the back of our home) is a space I wanted to hold a page of our story. When people come over to swim this may be the only part of our home they see. Last Thursday our "Gifts of Togetherness" was looking at lights and leaving little notes (below photo) at our favorite decorated homes in the neighborhood. The kids had so much fun running door to door giggling as they hung candy canes and messages on doors without getting caught. My friend sent me a funny video from her Ring app that caught my kids in action. Since then I've had several friends mention that their kids now want to do this. To encourage this I've created a printable for the little ones who can't write their own notes, or maybe those who would like to simplify this activity. I created it with the ideas that the lights could be colored. Click here to print your Christmas lights note cards! I hope you are enjoying this special time and are finding the time to create memories with your loved ones. My daughter had a very belated birthday celebration because she wanted to wait for our backyard renovations to be done. I know it's so hard to keep a guest list short, but with parties, less is more. In most situations. I also love a big bash with lots of mingling but, in my experience, the host tends to not enjoy themselves as much. The benefit of an intimate party is you have room to add special touches and sit around the same table sharing the same conversation. I adore this special touch my daughter added to the table decor. She wrote each of her friends a personal note telling them what she loved about them and how blessed she was to have them in her life. I took pictures of each note and sent to her guests. 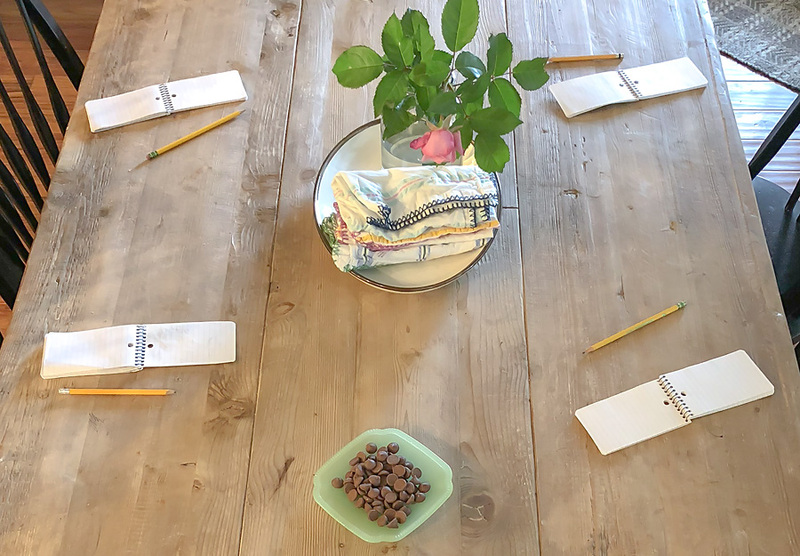 I watched as each sweet friend found their seat and gushed over the words Addi Mae left them. My husband and I made them a homemade meal and we served them as they simply chatted about their lives. Intentionally blurred table for my daughter to keep her personal notes to her friends personal. But you get the idea. This party was planned with one trip to target and a quick amazon order. Party animal napkins are from dollar section at target. This paper table runner is something I always have on hand for multiple purposes. The cake pops are from Mon Aimee Cake Pops and the best I've ever had. These sharpies take writing to a whole new level. And who doesn't want gold cutlery every once in a while. The only other decor item I purchased were these that gave the pool house just enough of a party vibe. Have you seen the saran wrap game played at parties? It was a hit! Target dollar section for the win again. I've had a lot of questions about these chaise lounge chairs! Love them. Highly recommend! And yes, I plan to do a full backyard tour soon to share how we renovated and decorated the space!